We all raise our thumbs up to wish success and good luck to our dear ones. 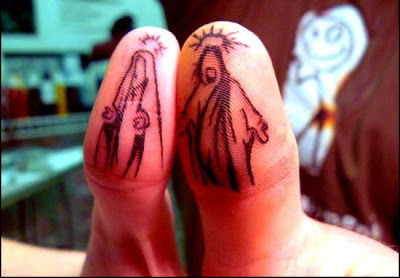 I think in this regards, Jesus and Mary tattoos on the thumbs is just like an icing-on-the-cake. For these tattoos carry blessings of the Holy Spirits as well. Isn’t it? Of course, these poor sketches could have been a little better, but who doesn’t seek the divine grace of Mother Mary and Jesus to proceed on the path of life? Besides being devoted to God, this fellow has also one brilliant mind. Every time he gives a thumbs-up to himself before the mirror, these tattoos will automatically pop-up to wish him good luck. I think the idea is simply great!